These gorgeous Authentic Vintage Austrian Swarovski crystals have a border edge to make them reflect a lot of light and shine like crazy. It was difficult to capture the beauty of the cut on these crystals, it is truly mesmerizing and seems to have endless depth. These are circa 1950 and one of a kind. 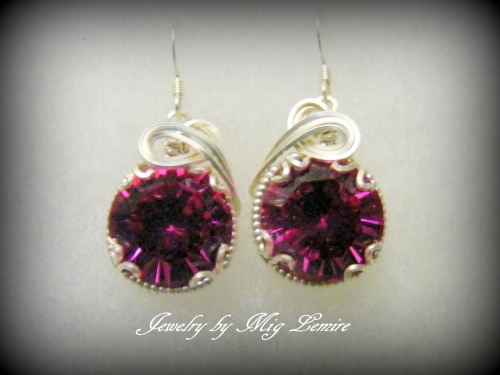 Beautiful magenta color and sculpted in sterling silver. Earrings measure from top or ear wire to bottom of crystal, 1 1/2" long and 3/4" wide.